We are a 501(c)3 NO KILL, volunteer based, animal rescue organization. We are dedicated to the most urgent abused and neglected animals in South Florida. We are a nonprofit organization dedicated to the care and rehabilitation of neglected and/or abused animals in Broward andMiami Dade County and to the education of the population about responsible and loving pet ownership. 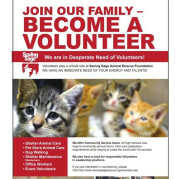 Our immediate need is recruitment of volunteers for the daily care of the animals who rely on us. Without regular volunteers we cannot adequately provide a quality of life for the more the 40 cats and kittens, dogs and other animals in our care, who are currently seeking forever homes. We need volunteers to clean cages, return to field, transport to appointments, foster, socialize and clean the facility.We also need volunteer coordinators, social media promotion, fundraisers and grant writers. Would you recommend SAVING SAGE ANIMAL RESCUE FOUNDATION INC?